Our latest, free eCookbook, Merry Christmas Breakfast: 16 Slow Cooker Christmas Breakfast and Brunch Recipes, is filled with Christmas breakfast recipes for an easy, merry morning. In our free, printable collection, you'll find delicious and simple slow cooker Christmas recipes to brighten you Christmas morning. This eCookbook includes chapters on sweet Christmas breakfast ideas and drinks. You’ll also find a variety of savory Christmas breakfast casseroles, as well as sweet breakfast casseroles for Christmas brunch. Why spend time slaving away in your kitchen when you could be enjoying that valuable holiday time with your family? Christmas morning is one of the most delightful mornings of the year, and it should be celebrated with delightful Christmas brunch recipes. The great part about using your slow cooker to cook Christmas breakfast recipes is that you don’t need to spend long in your kitchen preparing your morning meal. You can prep your dish, drop it into your crock, and go open presents with your family. Or, you can prep a slow cooker Christmas breakfast or brunch recipe the night before and let it cook overnight. You’ll wake up to delicious smells with little responsibility. If you choose to prep your meal that morning, a four-hour Christmas breakfast casserole recipe could be super handy. Prep it, and then enjoy time with your family while it cooks. After the last present is opened, you'll all be hungry for brunch! To get tasty slow cooker Christmas recipes to try on Christmas morning, download our free eCookbook, Merry Christmas Breakfast: 16 Slow Cooker Christmas Breakfast and Brunch Recipes. If there's ever a time to indulge, it's on Christmas morning! Whether you prepare your entire breakfast meal in the slow cooker, or just cook up a hot drink--such as cocoa--the slow cooker is sure to cook up something comforting and warm. If you you're cooking a Christmas breakfast casserole overnight, the wafting aromas of breakfast in the kitchen might wake you before the eager pitter-patter of your children's footsteps to the Christmas tree do. As your children tear through their colorful presents, you'll sit in eager anticipation of eggs, bacon, hashbrowns...or even monkey bread! 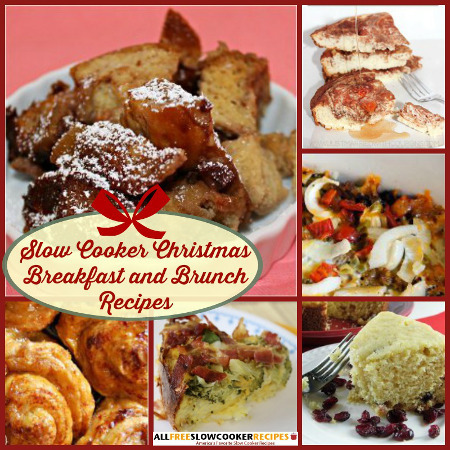 In our free eCookbook, Merry Christmas Breakfast: 16 Slow Cooker Christmas Breakfast and Brunch Recipes, you'll find bacon- and hash-brown-filled casseroles and quiches, along with French toast casseroles, monkey bread recipes, and two types of hot chocolate, among other tasty delights. Plan ahead for Christmas morning, and your family might enjoy your Christmas breakfast menu more than the presents! Read on to learn which Christmas breakfast foods you can expect from this slow cooker Christmas recipes free eCookbook and make sure to download your free copy today! That way, you can take these printable recipes for a slow cooker wherever you go and share them with friends. "Merry Christmas Breakfast: 16 Slow Cooker Christmas Breakfast and Brunch Recipes"
Our chapter on Sweet Christmas Breakfast Ideas & Drinks features lot of tasty treats includes, including two types of slow cooker hot cocoa. One such recipe (shown up above),for Wondrous Winter Hot Cocoa, is extra rich and creamy, made with heavy cream, sweetened condensed milk, chocolate chips, and more. 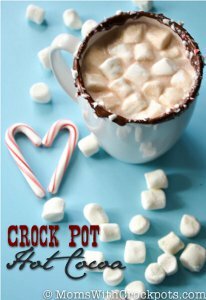 We've also included a recipe for Slow Cooekr Minty Hot Chocolate, which is made using York Peppermint Patties--you might even want to try this slow cooker drink recipe on Christmas Eve! Drinks aside, this chapter on Christmas sweets includes fun and versatile ways to "bake" using your slow cooker. If you've never tried slow cooker baking, there's no better time than Christmas! Your oven is full enough with the other dishes you are preparing, and you can bake ahead of time using your slow cooker, and enjoy a sweet treat on Christmas morning. Make sticky-sweet caramel rolls (shown above, left) with the greatest of ease using your slow cooker. 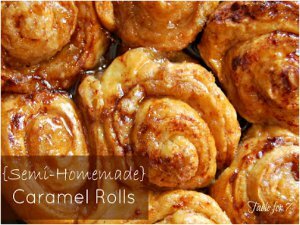 These caramel rolls are semi-homemade, which makes them extra easy to prepare. The incorporate refrigerator biscuits, so you don't need to create the dough from scratch. 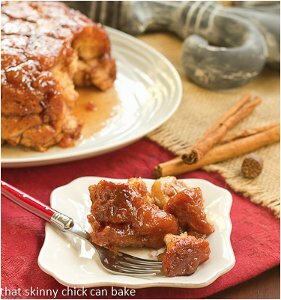 Similarly, you'll find two recipes for slow cooker monkey bread in our chapter on Sweet Christmas Breakfast Ideas & Drinks. One of the recipes is more traditional, and simply incorporates cinnamon and sugar; the other monkey bread recipe has an added fruity kick from apples and apple cider (shown above, right). If you'd rather "bake" something more traditional in your slow cooker that doubles as a make ahead Christmas breakfast or dessert recipe, our recipe for Slow Cooker Cranberry Orange Bread (shown above, center) is a must-try. This moist, sweet cake serves a crowd and it only takes 15 minutes to prepare. 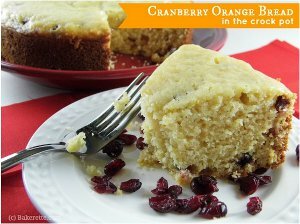 Grated orange peel and dried cranberries makes this cake fruity and tart. You could also "bake" up an extra cake to give as a holiday gift. Download your free copy of the Merry Christmas Breakfast: 16 Slow Cooker Christmas Breakfast and Brunch Recipes eCookbook today! Our chapter on Savory Christmas Breakfast Casseroles is filled with hearty breakfast casseroles your family will love. 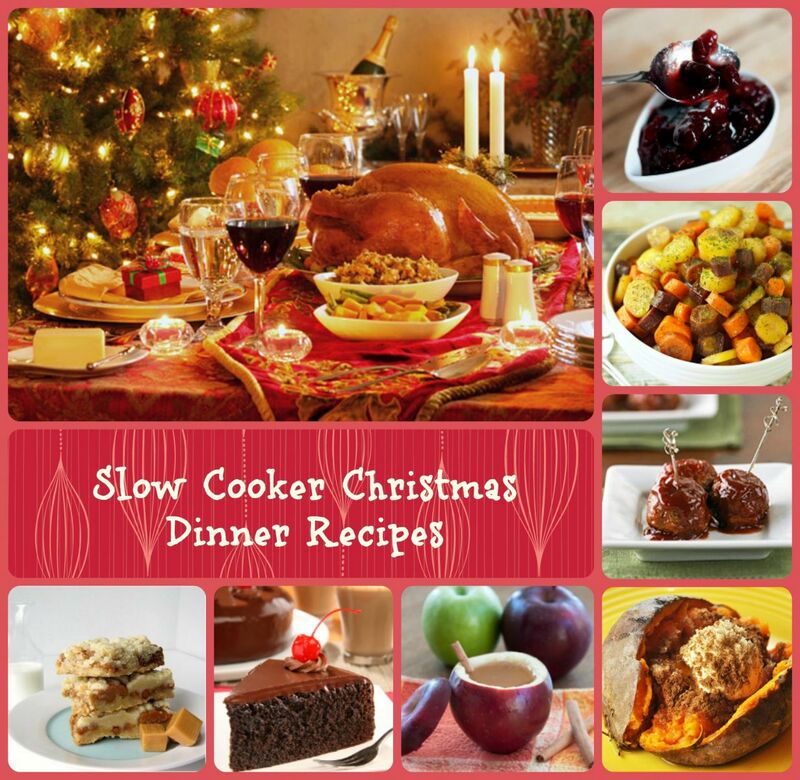 Many of the slow cooker casserole recipes in this chapter are make ahead Christmas breakfast recipes because they can cook overnight. You can prep these Christmas breakfast casseroles in minutes before bedtime on Christmas Eve, and then turn on your slow cooker and let it do all the work while you sleep and wait for Santa. 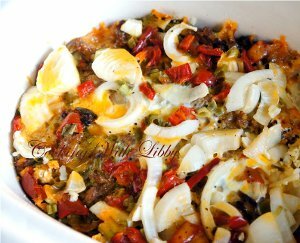 Our recipe for an Easy Italian Egg Strata (shown above, left), is not only tasty, but it is bursting with red and green Christmas colors--which makes it the perfect meal for Christmas morning. 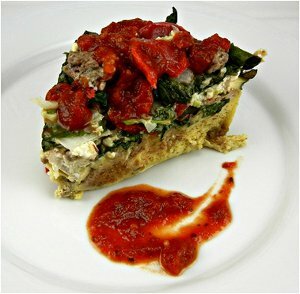 This unique Christmas breakfast casserole incorporates chunks of bread, sausage, eggs, spinach, cheese red peppers, and marinara sauce, which gives it a delicious, Italian touch. Our recipe for the Best Ever Loaded Breakfast Casserole (shown above, center) is super hearty, packed with bacon (or sausage), bell peppers, hash browns cheese, eggs, and more. For an elegant and easy choice, try our recipe for Potato-Crusted Quiche (shown above, right and on our cover). Hash browns for the crust for this easy and savory casserole, which is also packed with bacon, cheese, and eggs. Find out how to make these creative slow cooker recipes and more by downloading our free eCookbook, Merry Christmas Breakfast: 16 Slow Cooker Christmas Breakfast and Brunch Recipes. 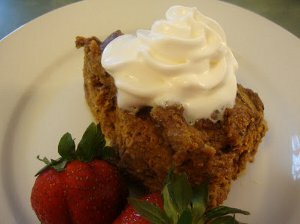 Our chapter on Sweet Breakfast Casseroles for Christmas Brunch has so many decadent options, it will be hard to choose. Whether you favor French toast or pancakes, you'll find fabulous Christmas morning breakfast casserole recipes among these options. Our recipe for Slow Cooker Apple French Toast Casserole (shown above, left) is moist and fruity, made with challah bread, walnuts, pecans, apples, and more. 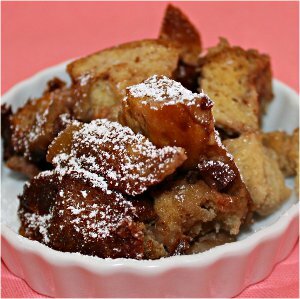 This fluffy, French toast casserole can't be missed! If you prefer pancakes, our recipe for a Cinnamon Swirl Slow Cooker Pancake Bake (shown above, center) is creative and easy. This recipe is simple to prepare, as it incorporates Bisquick--you don't have to make the batter from scratch. This recipe doesn't take long to cook, so you can prep it quickly in the morning and eat relatively early if you're starving. Finally, our chapter includes more options for French toast casserole, including our recipe for Easy Cinnamon French Toast Casserole (shown above, right). This recipe features a great shortcut because you incoporate cinnamon swirl bread, which is already loaded with cinnamon. 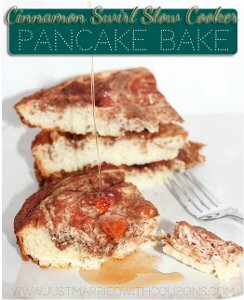 You can't go wrong with any of the delicious options in our chapter on Sweet Breakfast Casseroles for Christmas Brunch. Download our free eCookbook to get these sweet casseroles and more. You've had a great preview of what this new eCookbook has in store for you. If any or all of these recipes appeal to you, click on one of the eCookbook icons anywhere on this page to download your free copy of Merry Christmas Breakfast: 16 Slow Cooker Christmas Breakfast and Brunch Recipes. Once you get your copy, you can either keep it on your computer or eReader or print it out and keep it in your kitchen. No matter how you use your eCookbook, once you've tried even one of the recipes, you'll be glad you downloaded it. Lots of good ideas in this eBook. To start, I'm looking at the winter hot cocoa, overnight egg and sausage casserole, loaded breakfast casserole, monkey bread, and apple coffee cake. Slow cookers are the greatest small kitchen appliances, don't you think? My mom never had one I have three! I plan to use at least 4 of the recipes this week!